Preselection build on GraphicAll - please test! R4 ObjectMode/curves/lattice/surface! MAJOR RELEASE R4 ******** Download here. Adds preselection in Object Mode. Adds preselection for lattices, bezier/nurbs curves and surfaces. All supporting circle select and border select. Several bugfixes and fixing of memory leaks. Preselection on/off toggles are now on Npanel->Display instead of Mesh Display! Tuning of proportional falloff size has been shifted to Ctrl+Alt+Shift+MouseWheel! Vert / edge / face element highlighting under mouse with optional normal highlight on face. Ctrl+hover highlights vert / edge / face paths. Alt+hover highlights vert / edge / face loops or rings (with Ctrl). Circle select / border select highlight. Object highlighting in Object Mode + proportional + circle + border. Lattice point highlighting + proportional + circle + border. Curve/surface point highlighting + proportional + circle + border. Also active in UV editor. Highlighting is synced over all open views. Theme colors can be set for selected elements preselection / not-selected elements preselection and proportional preselection. This for both 3D View and UV/Image editor. Preselection can be turned on/off in the N-panel (under Display for 3D view), as can Proportional Preselection. As an added feature, Proportional Size can be adjusted using Ctrl + Alt + Shift + MouseWheel. N-panel also holds a new option to enable/disable normal highlighting (new icon next to face / vertex normal display buttons). Circle select is now a mode youre in. 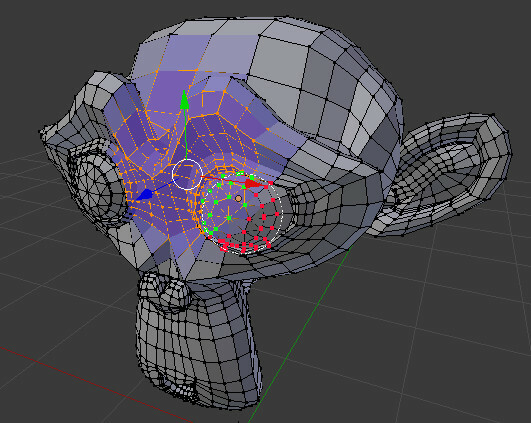 This means you can transform the viewport and use other tools during circle selecting. You switch in and out of circle select with Ckey. RIGHTMOUSE is used for selecting, LEFTMOUSE for deselecting. Alt+MOUSEWHEEL is used for tweaking the circle size. In UserPrefs > Editing theres a setting Circle Select -> Grow with Zoom. When this is on the proportional size will grow and shrink when zooming. Doesnt work in perspective mode! It is now possible to disconnect the 3D manipulator from geometry and freely move / rotate it anywhere you want by either using Gkey / Rkey or the manipulator itself with full support for Ctrl-snapping. You can then reconnect with the geometry and use the manipulator as normal but from the set location / orientation. Use Ctrl-snapping during rotation to point X-axis towards snapped position. The manipulator enters this new mode by using the button on the 3D header on the right of the Transform Orientation pulldown. Move manipulator and then untoggle this button for reconnecting with geometry; the Transform Orientation will show “Free”, which is a new mode that uses the set manipulator position / orientation til you switch it back to another setting. Also possible now is making a custom Transform Orientation when in this “Free” mode; the location of the manipulator will be saved along with its orientation, allowing manipulator settings to be recalled. I absolutely love this patch! Makes selecting much more predictable! Only inconsistency I found was that it is not respecting the Left/Right click switch I choose in the input preferences. Other then that - great tool! I don’t see any reason not to add this since it’s an option the user can decide to turn on or off. you’re awesome, i’ve been following the development of your presel addon and it’s great, this is what makes the blender community the best! sniff It’s so beautiful!! I never thought this day would come! On the direction-sensitive border select though, is there an option to disable that? Sometimes I’ll “draw boxes backwards” because that was where my cursor happened to be when I decided I needed to box some things. If my vote counted it would be in trunk as soon as the bugs are worked out. I love being able to navigate while circle selecting. alt and ctrl while circle selecting don’t seem to produce consistent results, and blender has disappeared twice in 5 minutes. If I can find anything I can reproduce consistently I’ll report it. Are there any scripts or tools that would generate a useful log after a blender crash? In circle select mode (faces) if you hover over a face then press alt the face loop is highlighted for a fraction of a second, then only the single face is highlighted, though if you click to select the loop is selected. If you start with alt held down and the mouse off the model then move over it no face loop is ever highlighted, just the single face, though if you click the loop will be selected. I had a blast testing the addon, can’t wait to test this as well! I pray that the Blender gods allow this in trunk. It’s going to be an uphill battle though! Would it be possible to add some kind of visual cue to indicate circle select mode aside from the circle? When it is down to the size of a point you can’t tell which mode you are in without click dragging to see if it will select or move the faces. select a face or face ring. Edit: actually, it looks like trying to change almost anything in the F6/Undo panel will cause a crash, including select/deselect. If you start Blender from command line, it will say that it saved a crash log somewhere, you could post that here. Will post future build versions with debug symbols, they allow better bug tracking. tried to build using scons, mingw, and it seems like is not supported, i added the needed defines in scons according to the cmake files you’ve altered, and it build successfully, BUT i can’t see the feature 1 on selection, should i enable something! i’ve checked other features you’ve mentioned, 2 & 3 & 4 works as expected. but i think click selection should be disabled with circle selection as it overlap each other. You should enable Preselection in the Npanel under Mesh Display -> Overlays. Thx for the patch, Ill include it!